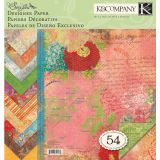 K&Company Double-Sided Designer Paper Pad - K&COMPANY-Que Sera Sera. With luxurious hypnotic textures and ripe vivacious hues Que Sera Sera breaths spirited creativity into any project inspiring whatever will be to be. This pack is full of bold, bright colors in florals, damask and more in pinks, oranges, yellows, blues, greens and many other colors. This package contains fifty-four 12x12in double-sided papers: three each of eighteen gorgeous designs. Imported.